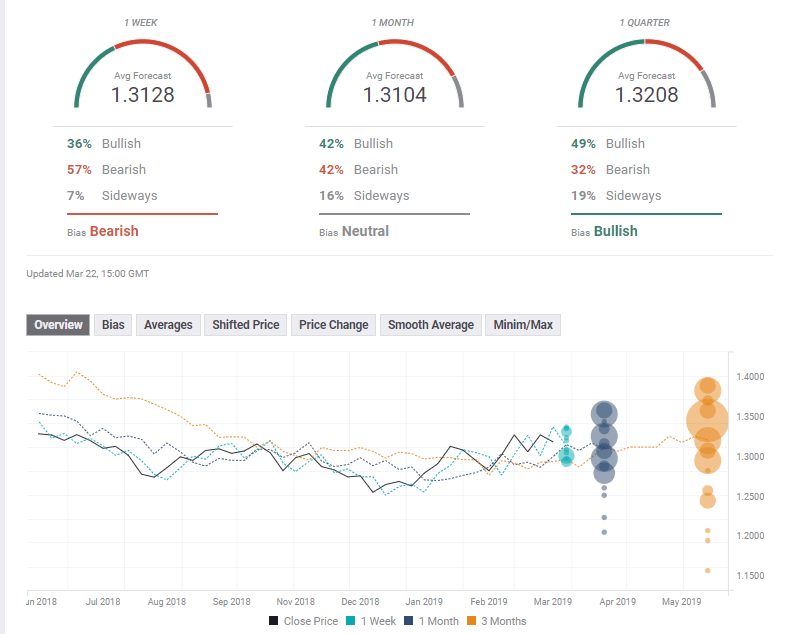 GBP/USD had another week of high volatility in which Brexit was delayed. Uncertainty remains exceptionally high, and Parliament has the key. The technical picture is bullish for the pair and experts are mixed on the next moves. Brexit has been delayed by two weeks to 12.4. For now. This is the bottom line after a turbulent week in UK politics and GBP/USD. It began with Speaker of the House of Common John Bercow refusing to allow a repeat vote of the exact same Brexit bill, throwing a spanner in the government’s plans. Things got worse when PM Theresa May asked for a short extension of Article 50 to June 30th, instead of a longer one. She wanted to use the time to try and pass Brexit once again. But the European Union had other plans. They accepted an extension to May 22nd, just before the European Parliament elections on May 26th, but only on the condition that Parliament approves the deal by April 12th. If not, it is up to the UK to decide what to do on ahead of the new Brexit deadline. The EU basically passed the baton from the government to the Parliament after May had reportedly refused to say what she will do if the plan fails. Brexit remains left, right, and center, but other events are also worth mentioning. Apart from Brexit, UK data was quite upbeat. The Unemployment Rate dropped to 3.9%, excellent news. Wages continue rising at a robust rate of 3.4%, inflation accelerated to 1.9%, and retail sales surprised to the upside with 0.4% in February. All this data would have led the Bank of England to raise rates, but Brexit uncertainty looms. The BOE left its policy unchanged expressing concern about uncertainty but still leaning towards hiking, assuming things are resolved. UK data had little impact on the pound, but the US Federal Reserve did move the dial, at least temporarily. The Fed took another dovish twist, signaling no interest rate increases in 2019 and an early end to shrinking the balance sheet, already in September. Also, Fed Chair Jerome Powell said that current data do not suggest a move in rates to one way or the other. In other words, a rate cut is on the cards as well. So, Brexit is in the hands of Parliamentarians. The chances of passing the Brexit bill are 5% according to French President Emmanuel Macron, and he has a point. Negotiations between the Northern Irish DUP and the government have not yielded any result. A group of hardline Brexiteers prefers a no-deal. The opposition maintains its line to reject the deal especially after May blamed them for not approving the accord. In this scenario, GBP/USD some room to the upside, perhaps 1.3500. According to quite a few political analysts, the No. 1 priority of the May is to conserve the Conservative Party. As the hard Brexitees have a stricter stance, she will go with them and against other considerations such as the economy. This scenario might not come to fruition in the upcoming week, but we may learn more about May’s intentions. In this scenario, GBP/USD has room to fall to 1.2000, but probably not now. Parliament may finally take matters into its own hands and hold symbolic votes on what kind of solution it wants. A softer Brexit or the Norwegian model of open borders and full participation in the EU’s single market and customs union may follow. Other options are a second referendum or new elections. All of these options mean delaying Brexit for an extended period, perhaps until the end of the year. The PM has hinted that she may step down if Brexit is postponed beyond June 30th. There are growing signs of dissatisfaction within her party and her government and a sense she lost control. If Parliament points the way to a different path, she could step down quite quickly. While markets do not like uncertainty, they absolutely hate Brexit. GBP/USD could jump all the way to 1.4000 even in the uncertainty of new elections. Like the previous scenario, it may not come into fruition this week, but approving “indicative votes” could indicate the path higher for the pound. The UK calendar is quite light with only GDP standing out. The final read of Q4 2018 GDP is expected to confirm the slow growth rate of 0.2% QoQ and 1.3% YoY. Revisions are not standard for the quarterly number, but the yearly figures are often modified. Consumer confidence may also be of interest. It may drop due to Brexit. Contrary to the UK, the American calendar is busier. Fed members are scheduled to speak throughout the week, beginning with Harker on Monday. They will likely repeat the same message. Housing data stand out on Tuesday with expected rises in Building Permits and Housing Starts. The House Price Indexes are also of interest. The Conference Board’s Consumer Confidence gauge on Tuesday will likely remain robust. The final read of US GDP is the primary event of the week. After the initial read surprised with 2.6% annualized, better than projected. The final number will likely show a downgrade after a few disappointing figures. The composition of growth is also of importance. The Core PCE Price Index is due on Friday. This is the Fed’s preferred measure of inflation. 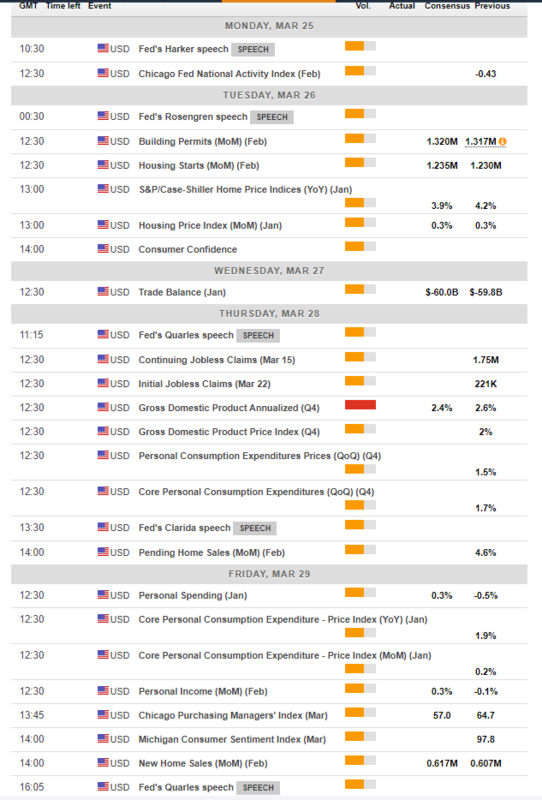 Other indicators are of interest as well on Friday, with New Home Sales closing the week. Apart from the busy week of data, trade talks continue with senior US officials traveling to Beijing. The past week saw contradicting headlines. On the one hand, China has reportedly backtracked on previous commitments, and President Donald Trump wants tariffs to remain for a long time. On the other hand, he seems optimistic about clinching an accord. GBP/USD is trading above the 50-day and 200-day Simple Moving Averages, despite a temporary dip below the 50 one. The SMA 50 recently crossed the 200 SMA, in the bullish “Golden Cross” pattern. Momentum remains positive, and the Relative Strength Index (RSI) is neutral. Cable also continues trading in the broad uptrend channel. All in all, bulls remain in control. 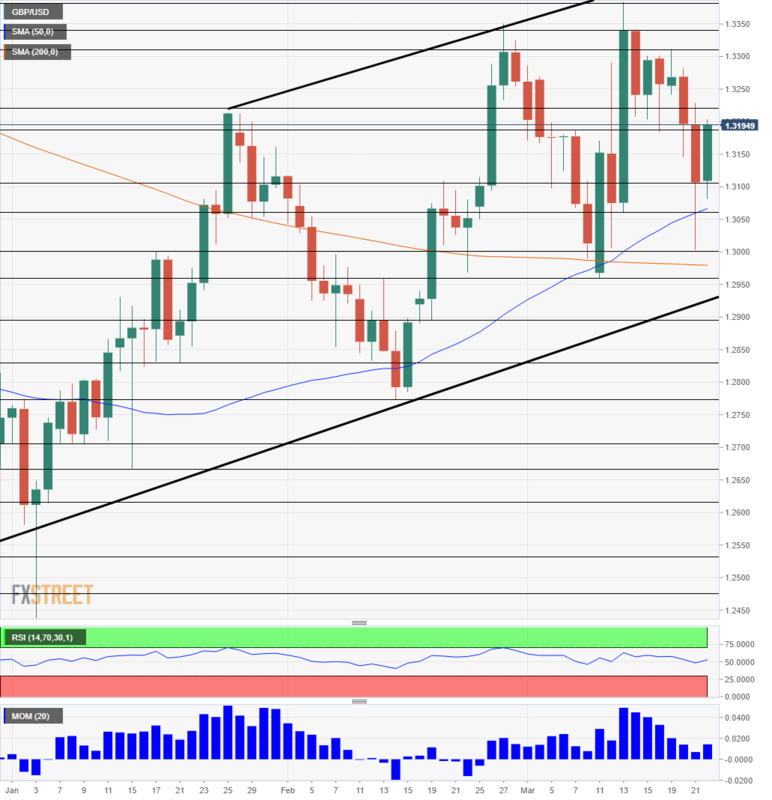 Resistance awaits 1.3190 which capped GBP/USD in early March and then served as support. 1.3220 was a high point in mid-January. 1.3305 was a high point in mid-March, and it is followed closely by 1.3350 that held it back in late February. The cycle high of 1.3388 is next. Support awaits at 1.3110 which was a swing low in early March and held the pair down in mid-February. 1.3000 is not only a round number but also a swing low seen recently. 1.2960 was a double bottom, being touched in both March and February. 1.2895 separated ranges in mid-February. It is important to remember that the nature of Brexit and the higher volatility mean that support and resistance lines may be shattered easily. Sterling bulls have reasons to be optimistic that a pro-Remain Parliament will take control and force a long delay of Brexit. However, the chaotic nature of deliberations in Parliament and the various complications and surprises mean that nothing is guaranteed. The FXStreet Poll shows a mixed picture for the next moves in Sterling. Brexit uncertainty takes its toll and makes forecasting hard. The short term bias is bearish, then turns neutral in the medium term and becomes bullish long term. The targets have not moved too much.